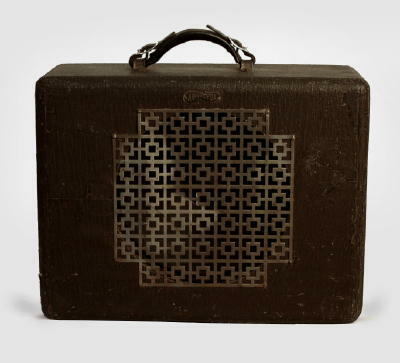 Audiovox Tube Amplifier, c. 1936, made in Seattle, WA, brown fabric covering finish. Height is 12 in. (30.5 cm. ), 15 1/4 in. (38.7 cm.) width, and 6 1/2 in. (16.5 cm.) deep. Very Good + Condition.